As well as cheap flowers you can save your money by choosing stunning flowers and only have one or two blooms for each centerpiece. 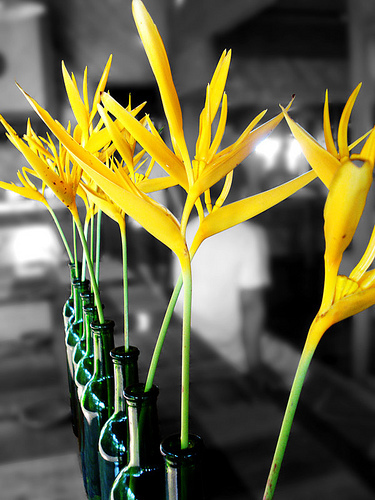 Just think about how beautiful a Bird of Paradise looks in a tall vase and you really don't need anything else. If you use an Eiffel vase which is the sort that gets thinner as you go up the vase you can display one tall flower and it wouldn't look cheap. Or how about colored bottles? Cheaper and stylish! You can also choose big flowers such as Hydrangeas which means that you also wouldn't need as many. A small cube vase can be filled with one Hydrangea head, plus they also look good in mason jars and bottles. Sunflowers also look great in either a tall vase or a smaller cube vase and are one of the few flowers that you can find in season in the Fall. 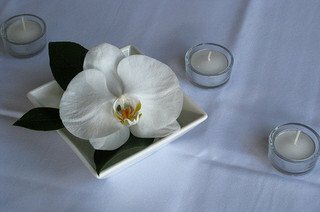 Orchids are expensive but they are gorgeous, having one single orchid in a shallow dish looks pretty. You could have 3 of these on a round table with glass votives scattered between them. 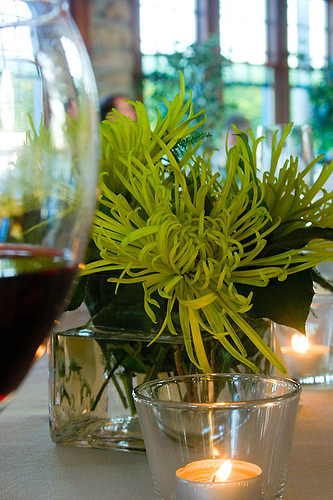 If the one single flower looks a bit lost on your tables you can added extra greenery. Ivy has long been associated with weddings and is believed to bring wedded bliss and can be added to lots of displays where you need something extra. And you can increase the size of your centerpiece by having glass votives around the single flower. The trick is not to spend more money than you have set aside for flowers. You also need to think about your bouquet, boutonnieres and bridesmaids flowers. One, great money saving idea for your flowers is to reuse your bouquet as the top tables' decorations, and the bridesmaids bouquets can go on the other tables. Only have one bridesmaid, no problem, use their flowers on the cake table, or gift table.